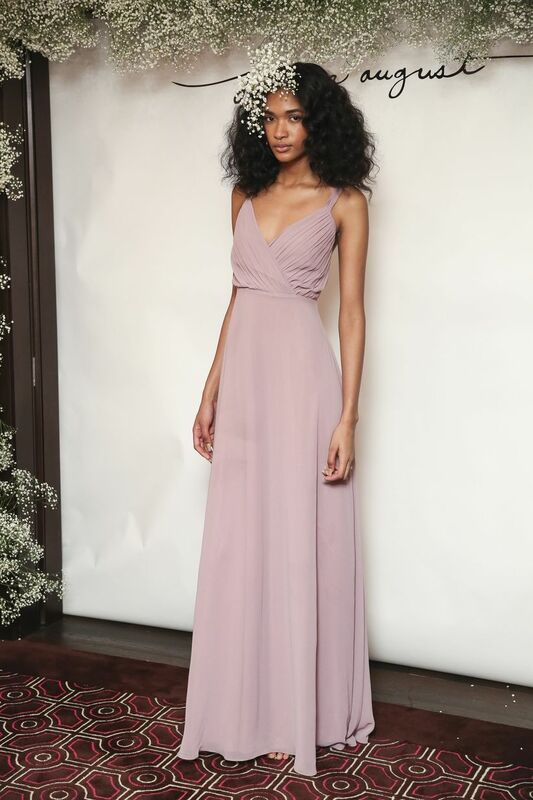 The 2019 bridesmaid dresses have finally been revealed and we’re loving how they’re totally mixing things up! These trendy bridesmaid dresses are moving away from the soft hues and feminine fabrics of seasons past. Instead, 2019 bridesmaid dresses are leaning more to the sultry and luxe side of fashion by featuring revealing slits, lush fabrics, and other eye-catching details. These 2019 bridesmaid dresses are totally changing the game for all the 'maids. It’s true, embroidery doesn’t have to be strictly for wedding dresses. 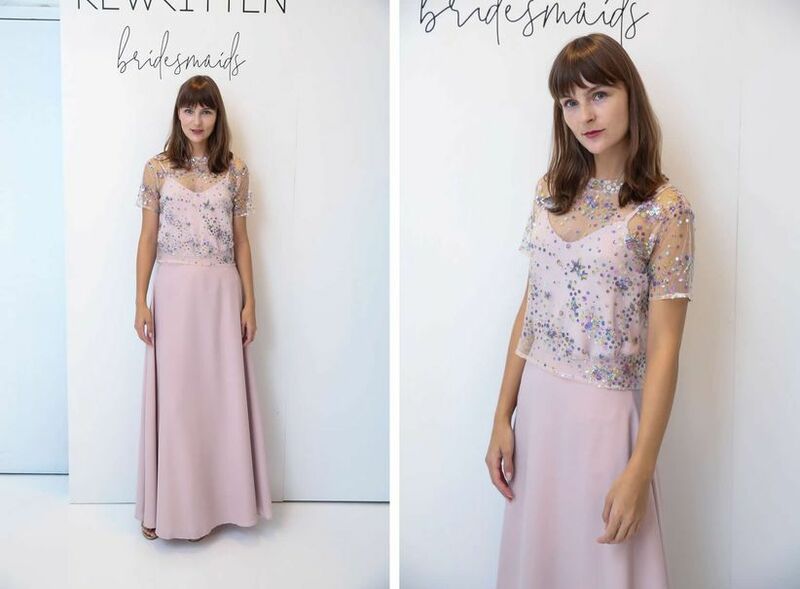 Bridesmaid dresses for 2019 can also be covered in multi embroidered embellishments to create a high-fashion wedding party look. Several collections, like Monique Lhuillier and Jenny Yoo, showcased wow-worthy dresses that featured oversized embroidered florals and leaves, which will definitely have ‘maids wanting to wear their bridesmaid dresses again. Popovers are literally popping up everywhere when it comes to 2019 bridesmaid dress trends. This layer of fabric over the bodice of gowns add a relaxed feel to dresses and are perfect for bohemian style weddings or outdoor ceremonies. They can come in any fabric too! From velvet to chiffon to even satin, popovers are a fab addition to 2019 bridesmaid dresses. 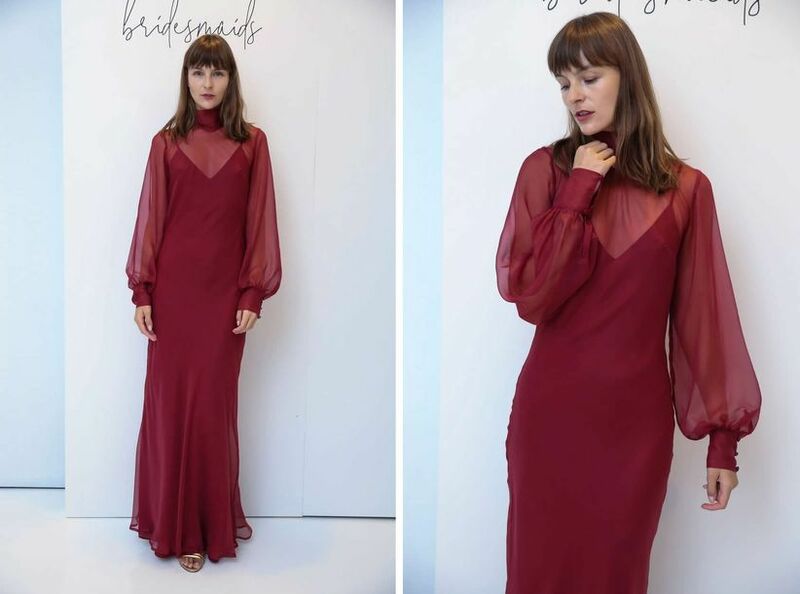 While sleeves became the “it” trend for brides a few years ago, this look is now making its way into 2019 bridesmaid dresses, too! 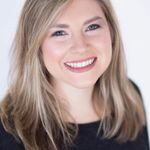 Balloon sleeves, bishop sleeves and even bell sleeves complement almost any type of dress style and are a great choice for bridesmaids that are in fall or winter weddings. 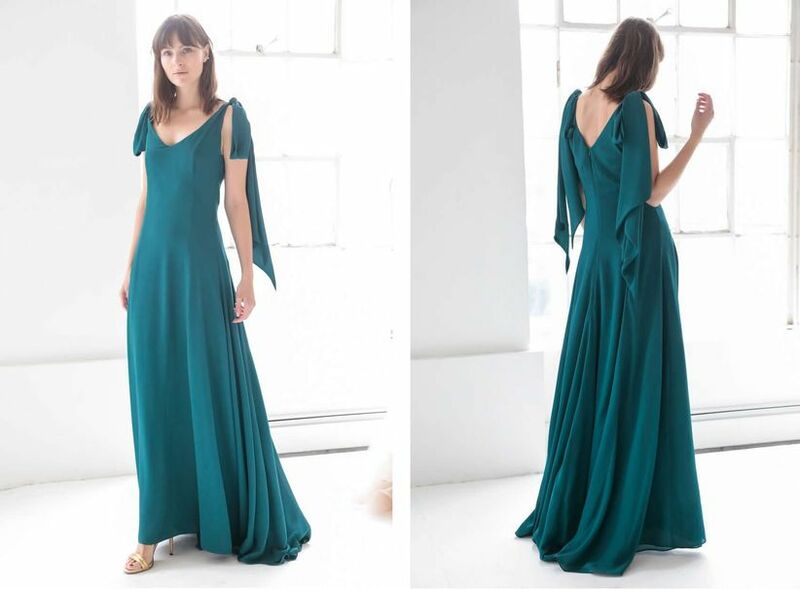 2019 bridesmaid dresses are all about showing some legs with the help of revealing slits. From thigh high side slits to front cut outs, ‘maids will have legs for days in these fashionable looks. Worried your grandmother may not be too fond of your besties flaunting so much skin on your wedding day? Don’t fret! These slits can be easily altered so they reveal just the right amount of leg. Jumpsuits are definitely here to stay for 2019 bridesmaid dress trends. From high neck options to wide pant legs, jumpsuits give bridesmaids an edgy, fashion-forward look. So, if you’ve been browsing modern bridesmaid dresses for your upcoming wedding, we think you should consider a cool girl jumpsuit, instead! 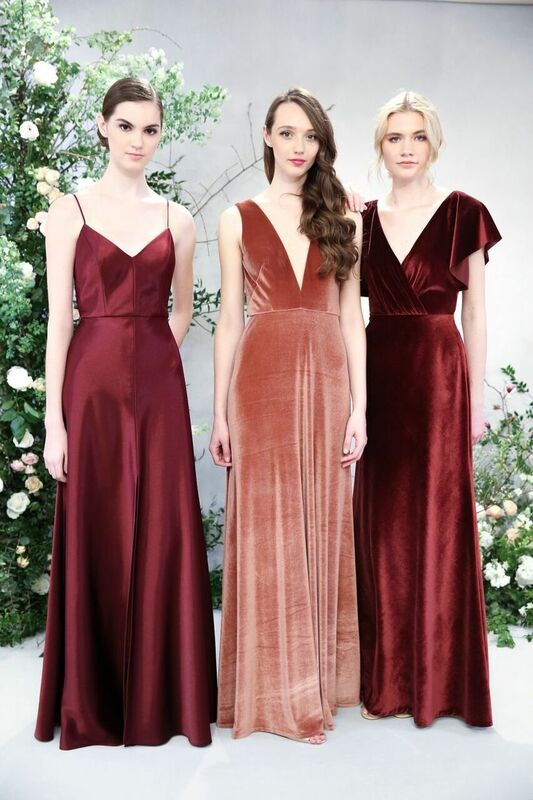 Blush has been the “it” color when it comes to classic bridesmaid dresses, however this season we saw a richer hue hit the runways—Nostalgia Rose. It’s still a pink but with hints of purple and was seen in almost every 2019 bridesmaid dress collection. The deeper and darker pink is an upgrade from the soft and girly blushes we’ve seen in the past. 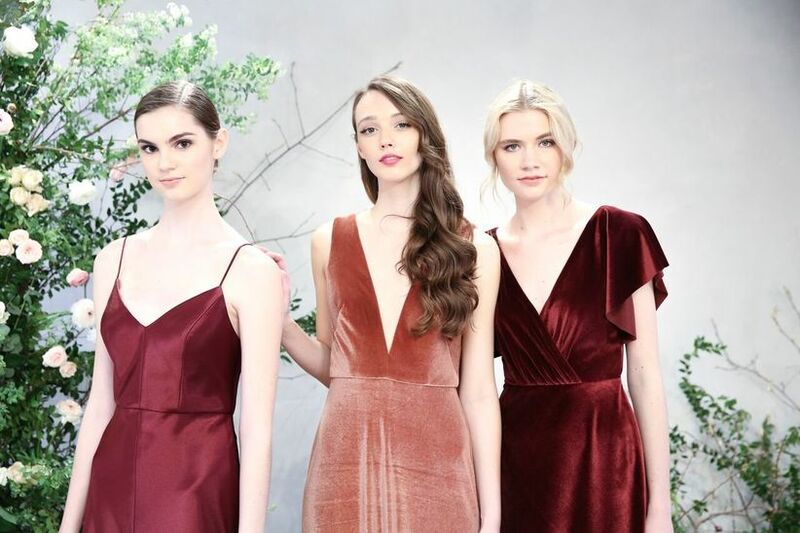 Calling all '90s obsessed brides and bridesmaids, velvet is making a comeback in the fashion world and we’re digging it for 2019 bridesmaid dresses. Instead of lighter fabrics like chiffon, velvet adds a bit of drama to your wedding party look—especially for fall or winter weddings. The luxe fabric can also be worn in a variety of colors, so you can easily mix and match your bridesmaid dresses, as well. Not a fan of the trending rich, sultry colors and hoping to find bridesmaid dresses for 2019 that lean more to a whimsical aesthetic? We got you covered! For brides with a bright and playful wedding style, we think you should have your leading ladies rocking this offbeat (but statement-worthy!) 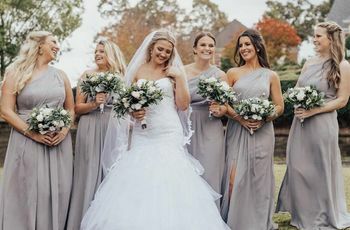 2019 bridesmaid dress trend. Iridescent-inspired bridesmaid dresses are letting ‘maids add some personality to their wedding party look. Featuring pearlescent colors, 3D appliques as well as other funky elements and embellishments, these 2019 bridesmaid dresses are perfect for anyone that’s unicorn-obsessed. We’ve seen cold-shoulders be a popular choice for bridesmaid dresses, but this year we think shoulders will get extra attention—thanks to the tied shoulder trend. 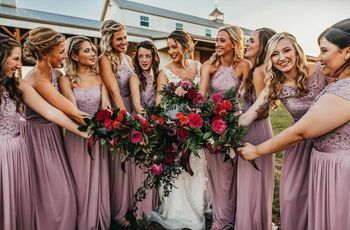 Tied shoulders give 2019 bridesmaid dresses a flirty look that’s perfect for outdoor ceremonies. The ties also can be adjusted, which lets ‘maids play around with different lengths and bow styles. 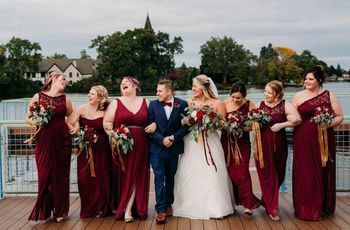 Fall jewel tones also stole the show this year for trendy bridesmaid dresses. These sultry hues added a pop of color, which is quite the contrast of the soft and muted hues we’ve seen in the past. From ruby red, to chartreuse to even emerald green, designers showcased an array of opulent hues that are totally changing up the look and feel of bridesmaid dresses. We also saw comfort play a major factor for designers when it comes to 2019 bridesmaid dresses. Wrap dresses, which are known for being universally flattering, were seen in a variety of collections and were also seen in short and long dresses. These styles help fit and flatter all body types and were paired with flutter or off-the-shoulder sleeves to evoke a flirty look for this season.